Since Akka enforces parental supervision every actor is supervised and (potentially) the supervisor of its children, it is advisable that you familiarize yourself with Actor Systems and supervision and it may also help to read Actor References, Paths and Addresses. Actor classes are implemented by extending the AbstractActor class and setting the “initial behavior” in createReceive method. createReceive method has no arguments and returns AbstractActor.Receive. It defines which messages your Actor can handle, along with the implementation of how the messages should be processed. You can build such behavior with a builder named ReceiveBuilder. This build has convenient factory in AbstractActor called receiveBuilder. Please note that the Akka Actor receive message loop is exhaustive, which is different compared to Erlang and the late Scala Actors. This means that you need to provide a pattern match for all messages that it can accept and if you want to be able to handle unknown messages then you need to have a default case as in the example above. Otherwise an akka.actor.UnhandledMessage(message, sender, recipient) will be published to the ActorSystem’s EventStream. The result of the receive method is a partial function object, which is createReceive method is AbstractActor.Receive which is a wrapper around partial scala function object. It is stored within the actor as its “initial behavior”, see Become/Unbecome for further information on changing the behavior of an actor after its construction. The recommended approach to create the actor Props is not supported for cases when the actor constructor takes value classes as arguments. This method is not recommended to be used within another actor because it encourages to close over the enclosing scope, resulting in non-serializable Props and possibly race conditions (breaking the actor encapsulation). On the other hand using this variant in a Props factory in the actor’s companion object as documented under “Recommended Practices” below is completely fine. There were two use-cases for these methods: passing constructor arguments to the actor—which is solved by the newly introduced Props.apply(clazz, args) Props.create(clazz, args) method above or the recommended practice below—and creating actors “on the spot” as anonymous classes. The latter should be solved by making these actors named classes instead (if they are not declared within a top-level object then the enclosing instance’s this reference needs to be passed as the first argument). An actor with AnyVal arguments. An actor with default constructor values. In both cases an IllegalArgumentException will be thrown stating no matching constructor could be found. The next section explains the recommended ways to create Actor props in a way, which simultaneously safe-guards against these edge cases. You might be tempted at times to offer an IndirectActorProducer which always returns the same instance, e.g. by using a lazy val. static field. This is not supported, as it goes against the meaning of an actor restart, which is described here: What Restarting Means. Techniques for dependency injection and integration with dependency injection frameworks are described in more depth in the Using Akka with Dependency Injection guideline and the Akka Java Spring tutorial. The Actor trait defines only one abstract method, the above mentioned receive, which implements the behavior of the actor. The AbstractActor class defines a method called createReceive, that is used to set the “initial behavior” of the actor. The implementations shown above are the defaults provided by the Actor trait. AbstractActor class. A path in an actor system represents a “place” which might be occupied by a living actor. Initially (apart from system initialized actors) a path is empty. When actorOf() is called it assigns an incarnation of the actor described by the passed Props to the given path. 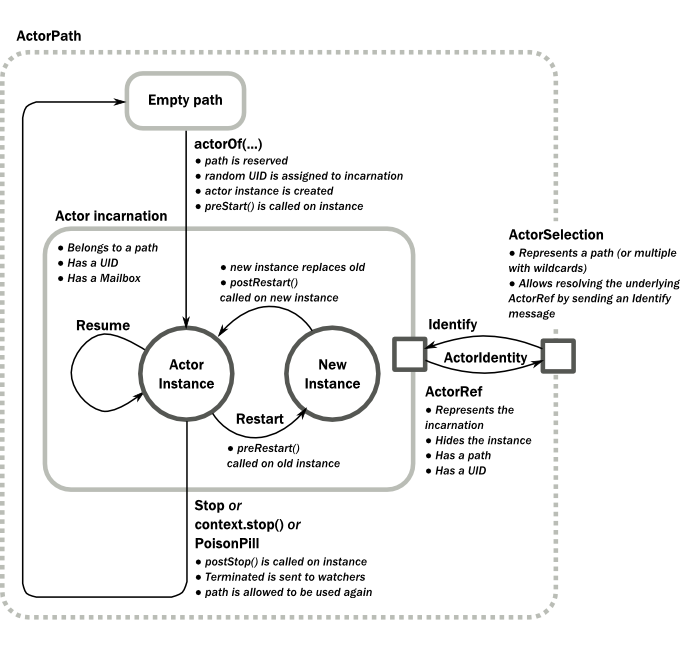 An actor incarnation is identified by the path and a UID. A restart only swaps the Actor instance defined by the Props but the incarnation and hence the UID remains the same. As long as the incarnation is same, you can keep using the same ActorRef. Restart is handled by the Supervision Strategy of actor’s parent actor, and there is more discussion about what restart means. It is important to note that Actors do not stop automatically when no longer referenced, every Actor that is created must also explicitly be destroyed. The only simplification is that stopping a parent Actor will also recursively stop all the child Actors that this parent has created. ActorSelection on the other hand points to the path (or multiple paths if wildcards are used) and is completely oblivious to which incarnation is currently occupying it. ActorSelection cannot be watched for this reason. It is possible to resolve the current incarnation’s ActorRef living under the path by sending an Identify message to the ActorSelection which will be replied to with an ActorIdentity containing the correct reference (see ActorSelection). This can also be done with the resolveOne method of the ActorSelection, which returns a Future of the matching ActorRef. 1. The old actor is informed by calling preRestart with the exception which caused the restart and the message which triggered that exception; the latter may be None if the restart was not caused by processing a message, e.g. when a supervisor does not trap the exception and is restarted in turn by its supervisor, or if an actor is restarted due to a sibling’s failure. If the message is available, then that message’s sender is also accessible in the usual way (i.e. by calling sender). This method is the best place for cleaning up, preparing hand-over to the fresh actor instance, etc. By default it stops all children and calls postStop. 2. The initial factory from the actorOf call is used to produce the fresh instance. 3. The new actor’s postRestart method is invoked with the exception which caused the restart. By default the preStart is called, just as in the normal start-up case. The supplied path is parsed as a java.net.URI, which means that it is split on / into path elements. If the path starts with /, it is absolute and the look-up starts at the root guardian (which is the parent of "/user"); otherwise it starts at the current actor. If a path element equals .., the look-up will take a step “up” towards the supervisor of the currently traversed actor, otherwise it will step “down” to the named child. It should be noted that the .. in actor paths here always means the logical structure, i.e. the supervisor. To acquire an ActorRef for an ActorSelection you need to send a message to the selection and use the sender() getSender() reference of the reply from the actor. There is a built-in Identify message that all Actors will understand and automatically reply to with a ActorIdentity message containing the ActorRef. This message is handled specially by the actors which are traversed in the sense that if a concrete name lookup fails (i.e. a non-wildcard path element does not correspond to a live actor) then a negative result is generated. Please note that this does not mean that delivery of that reply is guaranteed, it still is a normal message. You can also acquire an ActorRef for an ActorSelection with the resolveOne method of the ActorSelection. It returns a Future of the matching ActorRef if such an actor exists. (see also Java 8 Compatibility for Java compatibility). It is completed with failure akka.actor.ActorNotFound if no such actor exists or the identification didn’t complete within the supplied timeout. Messages can be any kind of object but have to be immutable. Scala Akka can’t enforce immutability (yet) so this has to be by convention. Primitives like String, Int, Boolean are always immutable. Apart from these the recommended approach is to use Scala case classes which are immutable (if you don’t explicitly expose the state) and works great with pattern matching at the receiver side.
! tell means “fire-and-forget”, e.g. send a message asynchronously and return immediately. Also known as tell.
? ask sends a message asynchronously and returns a FutureCompletionStage representing a possible reply. Also known as ask. In all these methods you have the option of passing along your own ActorRef. Make it a practice of doing so because it will allow the receiver actors to be able to respond to your message, since the sender reference is sent along with the message. The sender reference is passed along with the message and available within the receiving actor via its getSender() method while processing this message. Inside of an actor it is usually getSelf() who shall be the sender, but there can be cases where replies shall be routed to some other actor—e.g. the parent—in which the second argument to tell would be a different one. Outside of an actor and if no reply is needed the second argument can be null; if a reply is needed outside of an actor you can use the ask-pattern described next.. This example demonstrates ask together with the pipeTo pattern on futures, because this is likely to be a common combination. Please note that all of the above is completely non-blocking and asynchronous: ask produces a FutureCompletionStage, three two of which are composed into a new future using the for-comprehension and then pipeTo installs an onComplete-handler on the Future to affect CompletableFuture.allOf and thenApply methods and then pipe installs a handler on the CompletionStage to effect the submission of the aggregated Result to another actor. Using ask will send a message to the receiving Actor as with tell, and the receiving actor must reply with sender() ! reply getSender().tell(reply, getSelf()) in order to complete the returned FutureCompletionStage with a value. The ask operation involves creating an internal actor for handling this reply, which needs to have a timeout after which it is destroyed in order not to leak resources; see more below. To complete the FutureCompletionStage with an exception you need to send an akka.actor.Status.Failure message to the sender. This is not done automatically when an actor throws an exception while processing a message. Please note that Scala’s Try sub types scala.util.Failure and scala.util.Success are not treated specially, and would complete the ask FutureCompletionStage with the given value - only the akka.actor.Status messages are treated specially by the ask pattern. If the actor does not complete the FutureCompletionStage, it will expire after the timeout period, completing it with an AskTimeoutException. The timeout is taken from one of the following locations in order of precedence: specified as parameter to the ask method; this will complete the CompletionStage with an AskTimeoutException. The onComplete method of the FuturethenRun method of the CompletionStage can be used to register a callback to get a notification when the FutureCompletionStage completes, giving you a way to avoid blocking. You can forward a message from one actor to another. This means that the original sender address/reference is maintained even though the message is going through a ‘mediator’. This can be useful when writing actors that work as routers, load-balancers, replicators etc. The Receive can be implemented in other ways than using the ReceiveBuilder since it in the end is just a wrapper around a Scala PartialFunction. In Java, you can implement PartialFunction by extending AbstractPartialFunction. For example, one could implement an adapter to Vavr Pattern Matching DSL. See the Akka Vavr sample project for more details. If you want to have a handle for replying to a message, you can use sender() getSender(), which gives you an ActorRef. You can reply by sending to that ActorRef with sender() ! replyMsg. getSender().tell(replyMsg, getSelf()). You can also store the ActorRef for replying later, or passing on to other actors. If there is no sender (a message was sent without an actor or future context) then the sender defaults to a ‘dead-letter’ actor ref. Messages can be scheduled to be sent at a later point by using the Scheduler directly, but when scheduling periodic or single messages in an actor to itself it’s more convenient and safe to use the support for named timers. The lifecycle of scheduled messages can be difficult to manage when the actor is restarted and that is taken care of by the timers. Each timer has a key and can be replaced or cancelled. It’s guaranteed that a message from the previous incarnation of the timer with the same key is not received, even though it might already be enqueued in the mailbox when it was cancelled or the new timer was started. The timers are bound to the lifecycle of the actor that owns it, and thus are cancelled automatically when it is restarted or stopped. Note that the TimerScheduler is not thread-safe, i.e. it must only be used within the actor that owns it. Upon ActorSystem.terminate(), the system guardian actors will be stopped, and the aforementioned process will ensure proper termination of the whole system. Since stopping an actor is asynchronous, you cannot immediately reuse the name of the child you just stopped; this will result in an InvalidActorNameException. Instead, watch() the terminating actor and create its replacement in response to the Terminated message which will eventually arrive. You can also “kill” an actor by sending a Kill message. Unlike PoisonPill this will cause the actor to throw a ActorKilledException, triggering a failure. The actor will suspend operation and its supervisor will be asked how to handle the failure, which may mean resuming the actor, restarting it or terminating it completely. See What Supervision Means for more information. In general though it is not recommended to overly rely on either PoisonPill or Kill in designing your actor interactions, as often times a protocol-level message like PleaseCleanupAndStop which the actor knows how to handle is encouraged. The messages are there for being able to stop actors over which design you do not have control over. There is an extension named CoordinatedShutdown that will stop certain actors and services in a specific order and perform registered tasks during the shutdown process. # are added to these phases by individual Akka modules and user logic. # to make sure shutdown tasks are run in the right order. # - timeout=15s: Override the default-phase-timeout for this phase. #                and depending phases will not be executed. #                having been executed in earlier phases and may break if those are disabled. # The first pre-defined phase that applications can add tasks to. # Stop accepting new incoming connections. # established connections should be allowed to continue and complete if possible. # Wait for requests that are in progress to be completed. # also first telling them that it is time to close down. # Final shutdown of service endpoints. # This is where you would add tasks that forcefully kill connections that are still around. # after service shutdown and before cluster shutdown. # Graceful shutdown of the Cluster Sharding regions. # This phase is not meant for users to add tasks to. # Emit the leave command for the node that is shutting down. # the "cluster-sharding-shutdown-region" phase to complete before the shard coordinator is shut down. # after cluster shutdown and before ActorSystem termination. # Last phase. See terminate-actor-system and exit-jvm above. # dispatcher and scheduler of the ActorSystem have been shutdown. More phases can be added in the application’s configuration if needed by overriding a phase with an additional depends-on. Especially the phases before-service-unbind, before-cluster-shutdown and before-actor-system-terminate are intended for application specific phases or tasks. The default phases are defined in a single linear order, but the phases can be ordered as a directed acyclic graph (DAG) by defining the dependencies between the phases. The phases are ordered with topological sort of the DAG. The returned Future[Done] CompletionStage<Done> should be completed when the task is completed. The task name parameter is only used for debugging/logging. Tasks added to the same phase are executed in parallel without any ordering assumptions. Next phase will not start until all tasks of previous phase have been completed. If tasks are not completed within a configured timeout (see reference.conf) the next phase will be started anyway. It is possible to configure recover=off for a phase to abort the rest of the shutdown process if a task fails or is not completed within the timeout. Tasks should typically be registered as early as possible after system startup. When running the coordinated shutdown tasks that have been registered will be performed but tasks that are added too late will not be run. It’s safe to call the run runAll method multiple times. It will only run once. When using Akka Cluster the CoordinatedShutdown will automatically run when the cluster node sees itself as Exiting, i.e. leaving from another node will trigger the shutdown process on the leaving node. Tasks for graceful leaving of cluster including graceful shutdown of Cluster Singletons and Cluster Sharding are added automatically when Akka Cluster is used, i.e. running the shutdown process will also trigger the graceful leaving if it’s not already in progress. If you have application specific JVM shutdown hooks it’s recommended that you register them via the CoordinatedShutdown so that they are running before Akka internal shutdown hooks, e.g. those shutting down Akka Remoting (Artery). Akka supports hotswapping the Actor’s message loop (e.g. its implementation) at runtime: invoke the context.become method from within the Actor. become takes a PartialFunction[Any, Unit] PartialFunction<Object, BoxedUnit> that implements the new message handler. The hotswapped code is kept in a Stack which can be pushed and popped. This variant of the become method is useful for many different things, such as to implement a Finite State Machine (FSM, for an example see Dining Hakkers). Dining Hakkers). It will replace the current behavior (i.e. the top of the behavior stack), which means that you do not use unbecome, instead always the next behavior is explicitly installed. The Stash trait AbstractActorWithStash class enables an actor to temporarily stash away messages that can not or should not be handled using the actor’s current behavior. Upon changing the actor’s message handler, i.e., right before invoking context.become or context.unbecome getContext().become() or getContext().unbecome(), all stashed messages can be “unstashed”, thereby prepending them to the actor’s mailbox. This way, the stashed messages can be processed in the same order as they have been received originally. An actor that extends AbstractActorWithStash will automatically get a deque-based mailbox. The abstract class AbstractActorWithStash implements the marker interface RequiresMessageQueue<DequeBasedMessageQueueSemantics> which requests the system to automatically choose a deque based mailbox implementation for the actor. If you want more control over the mailbox, see the documentation on mailboxes: Mailboxes. Invoking stash() adds the current message (the message that the actor received last) to the actor’s stash. It is typically invoked when handling the default case in the actor’s message handler to stash messages that aren’t handled by the other cases. It is illegal to stash the same message twice; to do so results in an IllegalStateException being thrown. The stash may also be bounded in which case invoking stash() may lead to a capacity violation, which results in a StashOverflowException. The capacity of the stash can be configured using the stash-capacity setting (an Int) of the mailbox’s configuration. Invoking unstashAll() enqueues messages from the stash to the actor’s mailbox until the capacity of the mailbox (if any) has been reached (note that messages from the stash are prepended to the mailbox). In case a bounded mailbox overflows, a MessageQueueAppendFailedException is thrown. The stash is guaranteed to be empty after calling unstashAll(). Note that the Stash trait must be mixed into (a subclass of) the Actor trait before any trait/class that overrides the preRestart callback. This means it’s not possible to write Actor with MyActor with Stash if MyActor overrides preRestart. Note that the stash is part of the ephemeral actor state, unlike the mailbox. Therefore, it should be managed like other parts of the actor’s state which have the same property. The Stash trait’s AbstractActorWithStash implementation of preRestart will call unstashAll(), which is usually the desired behavior. If you want to enforce that your actor can only work with an unbounded stash, then you should use the UnboundedStash trait AbstractActorWithUnboundedStash class instead. If an exception is thrown while a message is being processed (i.e. taken out of its mailbox and handed over to the current behavior), then this message will be lost. It is important to understand that it is not put back on the mailbox. So if you want to retry processing of a message, you need to deal with it yourself by catching the exception and retry your flow. Make sure that you put a bound on the number of retries since you don’t want a system to livelock (so consuming a lot of cpu cycles without making progress). If code within an actor throws an exception, that actor is suspended and the supervision process is started (see supervision). Depending on the supervisor’s decision the actor is resumed (as if nothing happened), restarted (wiping out its internal state and starting from scratch) or terminated. Sometimes it can be useful to share common behavior among a few actors, or compose one actor’s behavior from multiple smaller functions. This is possible because an actor’s receive method returns an Actor.Receive, which is a type alias for PartialFunction[Any,Unit], and partial functions can be chained together using the PartialFunction#orElse method. You can chain as many functions as you need, however you should keep in mind that “first match” wins - which may be important when combining functions that both can handle the same type of message. For example, imagine you have a set of actors which are either Producers or Consumers, yet sometimes it makes sense to have an actor share both behaviors. This can be achieved without having to duplicate code by extracting the behaviors to traits and implementing the actor’s receive as combination of these partial functions. Instead of inheritance the same pattern can be applied via composition - compose the receive method using partial functions from delegates. Initialization might be necessary every time an actor is instantiated, but sometimes one needs initialization to happen only at the birth of the first instance when the ActorRef is created. The following sections provide patterns for different initialization needs. Using the constructor for initialization has various benefits. First of all, it makes it possible to use val fields to store any state that does not change during the life of the actor instance, making the implementation of the actor more robust. The constructor is invoked when an actor instance is created calling actorOf and also on restart, therefore the internals of the actor can always assume that proper initialization happened. This is also the drawback of this approach, as there are cases when one would like to avoid reinitializing internals on restart. For example, it is often useful to preserve child actors across restarts. The following section provides a pattern for this case. The method preStart() of an actor is only called once directly during the initialization of the first instance, that is, at creation of its ActorRef. In the case of restarts, preStart() is called from postRestart(), therefore if not overridden, preStart() is called on every restart. However, by overriding postRestart() one can disable this behavior, and ensure that there is only one call to preStart().